Pizza is often eaten with soft drinks or beer and paired with sides like bread sticks or a great caesar salad. If you have been looking for something finer to pair with your favorite pie, consider wine. Wine is one of the most popular alcoholic beverages in the world, so it makes sense to enjoy it with one of the most popular foods in the world. Different wines will add a different level of flavor to your pizza depending on the toppings. Here are some of the best Pop Up Pizza and wine pairings! This is our version of classic pepperoni pizza. Our special Chicago pepperoni is a blend of cured beef and pork with tons of spices for that added flavor. If you are looking for a great wine to pair with The Main St., consider a full bodied wine with hints of berry flavors, like a Merlot, Sangiovese or a great Zinfandel. 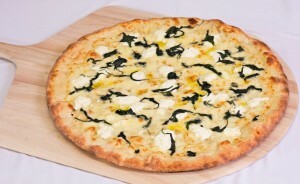 This is one of our most popular white pizzas featuring mozzarella and ricotta cheeses, roasted garlic oil and spinach. White pizzas offer up a wider selection of wine pairings because they step away from the highly acidic tomato sauce. If you are looking for a great wine to pair with our White Chapel pizza, consider a light to medium bodied wine with hints of citrus fruit. For red, go with Pinot Noir and for white, go with Pinot Grigio or Chardonnay. 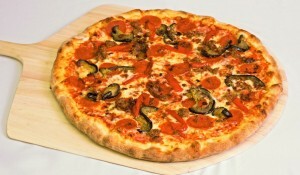 This is our version of a meat lover’s pie featuring pepperoni, bacon, Italian sausage, roasted peppers and eggplant. Like the Main St. pizza, if you are looking for a great wine to pair with our Fremont, consider a fuller bodied wine with hints of berry to balance out the fats in the meat. Great pairings for this include Italian Chianti, Barbera, or Zinfandel. 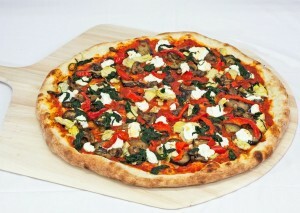 Our version of a premium veggie pizza including ricotta cheese, roasted artichoke, peppers, eggplant, spinach, mushrooms and roasted garlic oil. With most vegetable pizzas, the flavors are complex but not quite as strong as pizzas with meats. If you are looking for a great wine to compliment The Newport, light to medium bodied wines are best. Consider a light bodied Cabernet Franc, a delicate Pinot Noir or a Sauvignon Blanc if you want a great white. 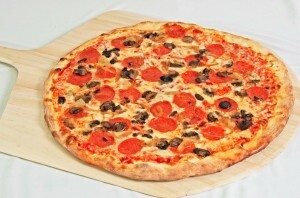 This is our version of a great variety pizza featuring mozzarella, roasted mushrooms, caramelized onions and pepperoni. Although the 5th Street features pepperoni, the real stars of this pie are the delicious mushrooms and caramelized onions. To compliment the meatiness of the mushrooms and the earthiness of the onions, stick to light to medium bodied wines with spicy and earthy tones. Consider a Pinot Noir, Zinfandel or Chardonnay. If none of these pizzas are what you are looking for create your own Pop Up Pizza and pair it with a glass of your favorite wine. 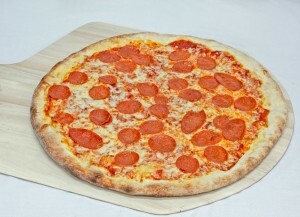 If you are looking for delicious pizza delivery in 89101, call Pop Up Pizza at (702) 366-0049 to place your order now!